Houzz contributor and head curator at Rise Art which showcases, rents and sells great contemporary art from both established artists and emerging talents, hand-picked by experts. 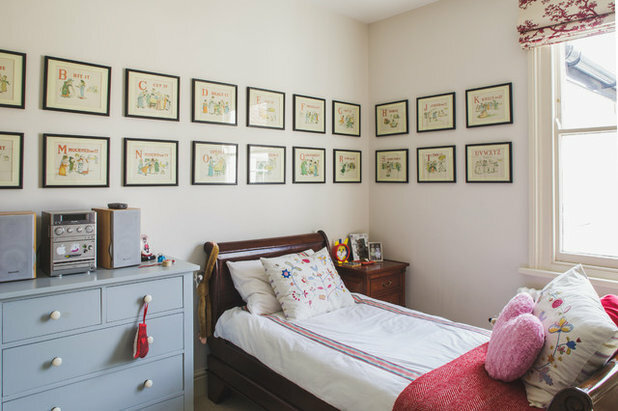 Creating a gallery wall in your home can be an affordable way to transform a room with the paintings, photographs, illustrations and personal pieces that matter to you. 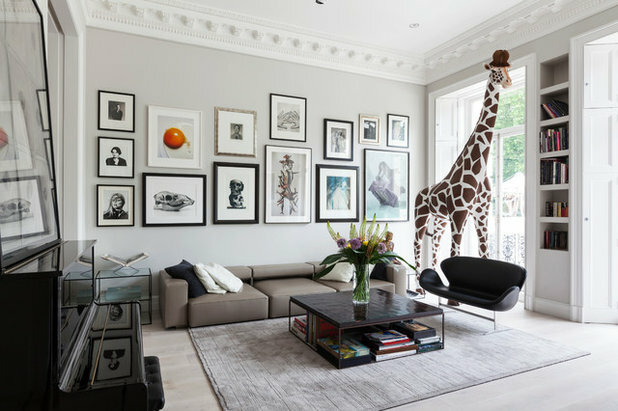 Whether you want to create a statement in your living room or simply make a staircase or blank wall come alive, a gallery is a fun way to express yourself and showcase favorite items. For the uninitiated, creating a gallery wall can seem daunting, yet with a few tools and some creativity, you can have a simple selection up in no time. 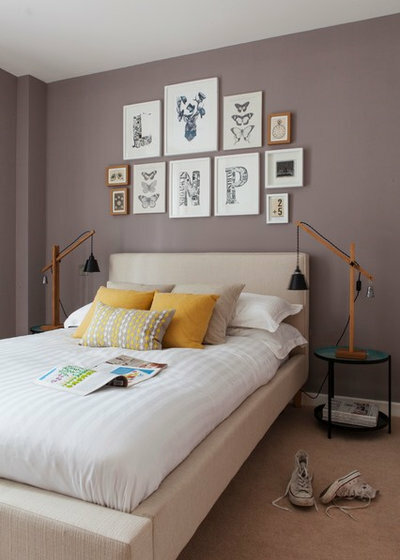 Here are some practical tips and style ideas to make your gallery wall stand out. Determine your style. Love lithographs? Fancy foxes? 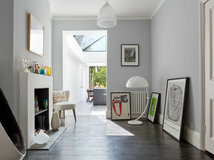 A gallery wall is your opportunity to style your home to reflect your passions and interests. Galleries can be tied together by theme, frame color, style or image palette. 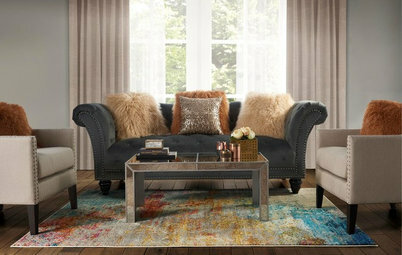 Tip: In a busy room with lots of patterns and textures, the key is to stick to a single hue, perhaps adding small splashes of color into the mix. Keep it personal. 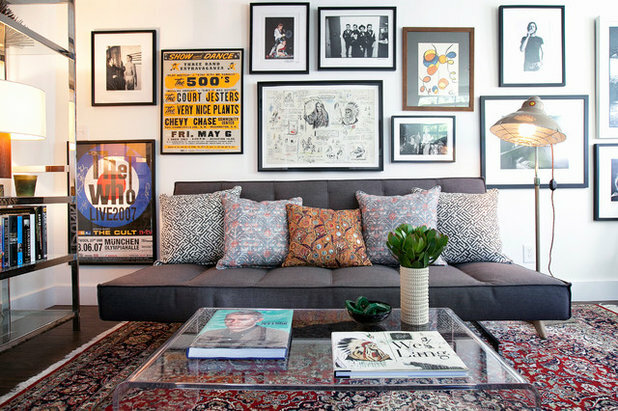 It’s your home, so use art and personal effects to make your gallery wall stand out. 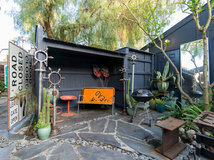 We love it when clients combine art they’ve purchased with family photos, sculptures, artifacts and children’s drawings. Tip: Looking for fun ways to expand your gallery or add one more work to your theme? Consider using old calendars, movie posters or inexpensive illustrations. Start with the largest item first. Balance and symmetry are key to creating a gallery wall that works. Start with the largest piece and use it as the focal point. Work from the center out. 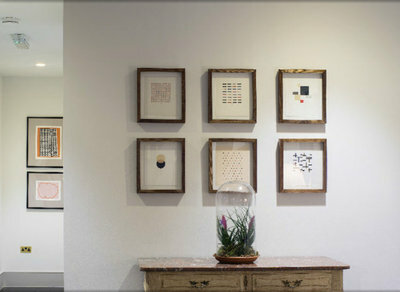 We recommend spacing artwork at least 1¼ inches (3 centimeters) apart to make each piece stand out on its own. 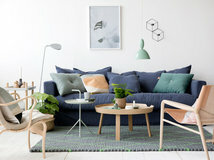 Try to keep the overall pattern balanced against other furniture or centered in a room. Tip: Before you break out the hammer, lay the art out on the floor and cut newspaper to the size of each piece. Using masking tape, position the paper on the wall as you would the art, then try a few different arrangements until you’re happy with the effect. Choose the right frames. 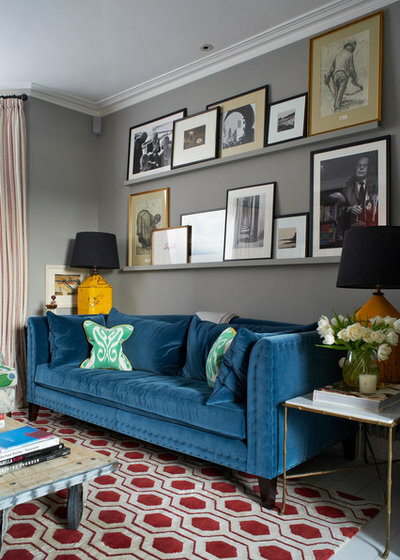 If you’re working with a collection of artwork across themes, using frames of a similar design or style is one way to tie the collection to your home’s style. 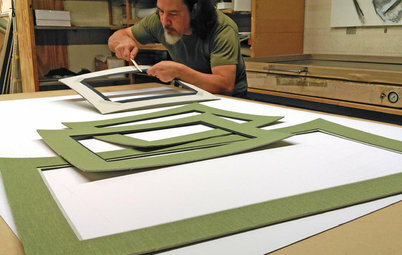 Tip: Reclaimed frames and made-to-order frames without glass can be an inexpensive way to make your art stand out. 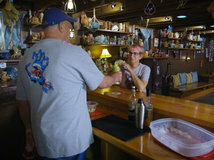 Think shelf life. Using shelves is another way to create a gallery wall that can easily be updated without the need to rehang. 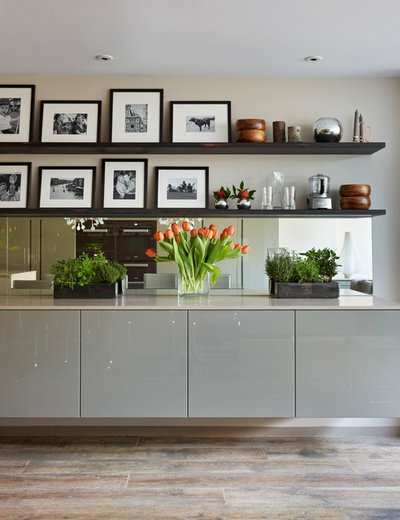 If you don’t have a built-in ledge or shelf, you can buy thin shelving made for art display quite inexpensively, then paint it to suit your design. Tip: Most gallery wall shelving displays are no more than two shelves in height. 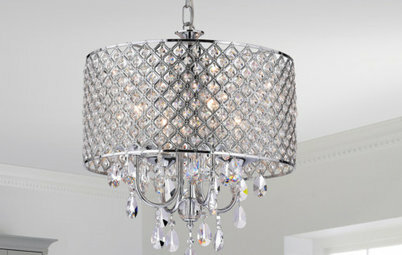 This creates an open look and allows enough space to accommodate larger works. Hang with precision. There’s nothing more frustrating than hanging your art only to realize it’s at the wrong height. Most galleries hang works with the center of the piece 59 inches (150 centimeters) from the floor, so it sits at average eye level. Use a level and pencil to mark the holes before you drill. Double check each measurement to ensure you have the right height and balance. Tip: Consider using D-rings rather than wire or string when hanging art. Most wires on frames are attached with D-rings, so simply remove the wire and insert two screws in the wall that fit inside the rings. Hanging this way eliminates the prospect of crooked artwork in the future. Or keep lines sharp. Creating a sharp boundary above a piece of furniture can open up the room and, in some cases, limit potential damage to art. 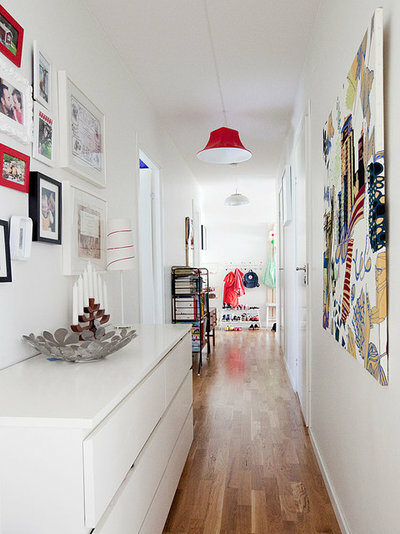 Try to keep your gallery wall at least 12 inches (30 centimeters) above furniture. We love this gallery wall, whose tones balance the room perfectly while providing the perfect pop of color through a single orange artwork. Go for a calming effect. 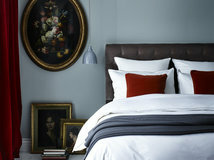 In bedrooms, stick to soft palettes with splashes of color that complement the furniture. 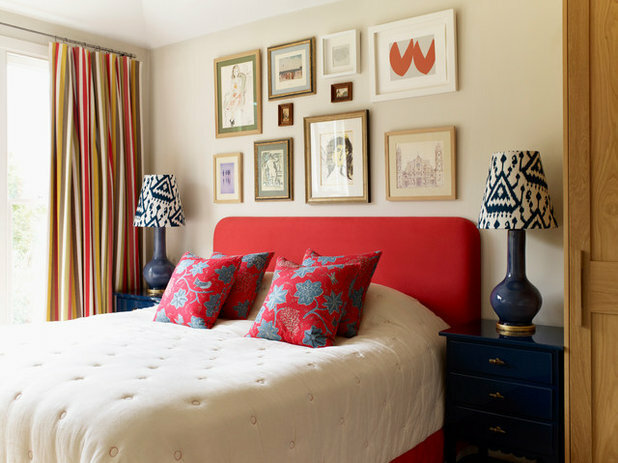 Bedrooms look better with gallery walls that aren’t too busy — this is where you come to unwind and sleep, after all. Keep things feeling spacious by limiting your gallery to two rows. Build a grid. 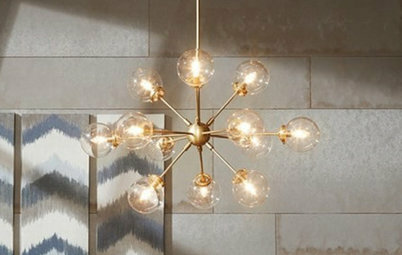 Gone are the days when a single statement piece of art above furniture was the norm. We love this grid pattern set above a chest of drawers. 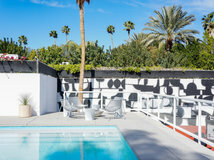 Certain artwork, including pieces in a series, geometric works or other minimal lines look best in a grid. Smaller works in a series are particularly nice in this format. Fill a niche. Have fun and be playful. 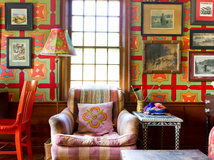 Gallery walls can be added to any nook in the house. A small desk with a blank wall can be transformed into a butterfly preserve, for example, as seen here. 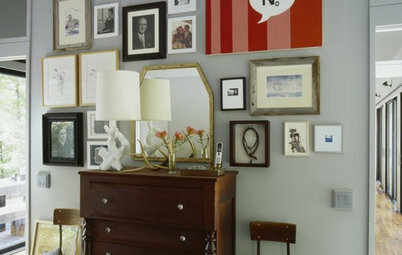 Gallery walls don’t need to be done in a single cluster. 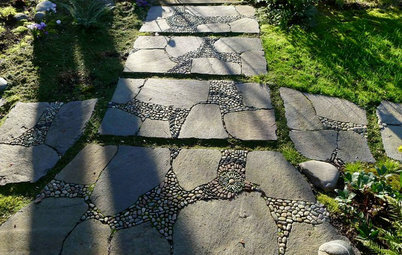 Consider spacing out the works in balanced patterns. In this room, the homeowner has clustered only the core artwork, then used a few pieces outside the cluster to give the feeling of the works taking flight. Line a kitchen shelf. 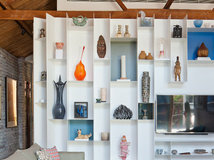 Create a gallery wall using existing shelves for a flexible and high-impact display. 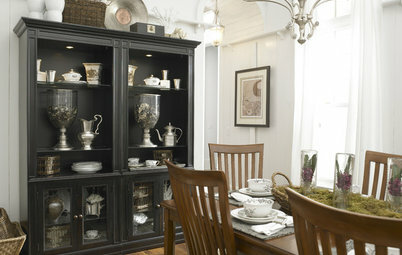 Combining artwork with kitchen items, for instance, can turn a storage shelf into a work of art. 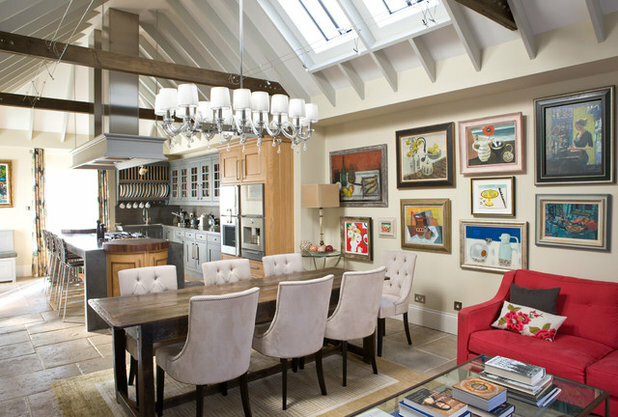 When displaying art in kitchens, beware of placing it near heat sources and areas with high humidity. Gallery walls consisting of plates or decorative trays carry less risk of damage. Lighten and brighten. In darker hallways, lofts or spaces without a lot of depth, create an airy atmosphere by using bright colors, minimal designs and white frames. We especially love geometric artworks for bringing a space to life. Make a dramatic landing. Staircases are often overlooked when it comes to decorating, and what a pity — they’re one of the highest-traffic areas in the home. 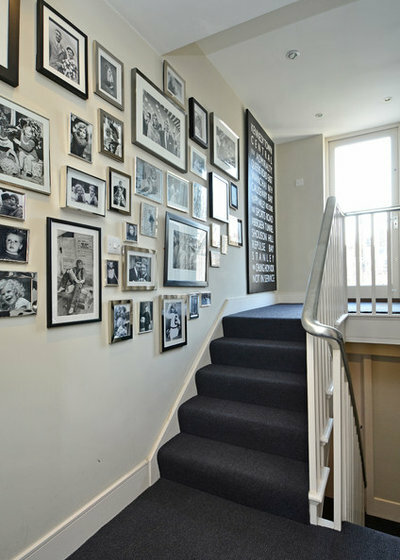 Create a gallery that draws in the eye by staggering work along the staircase wall. Keep the center of your gallery near the 59-inch (150-centimeter) height, and allow 10 inches (25 centimeters) from each stair to avoid damage when vacuuming. Offsetting a gallery wall with a lone, larger artwork — as seen here, with the big typography piece at the far end — is a great way to add extra punch to a space. 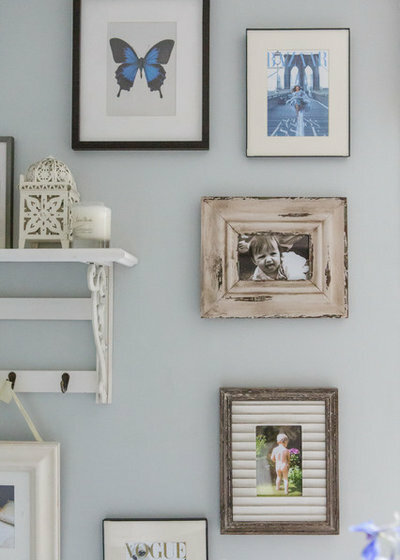 Tell us: Have you created a gallery wall? Share your tips and photos in the Comments. Our daughter's gallery wall. Rectangular outline, random spacing within. Probably needs a few more small things, but here it is for now, filled with watercolours from her Great Grandmother, a Louis Burnett Moulin Rouge oil, pieces from Bolivia, and frames, clipboards, and shadow boxes for her to fill as time permits. We have created a mini art gallery with some art my husband had for years, art we have purchased from local shops & from photos I have taken. 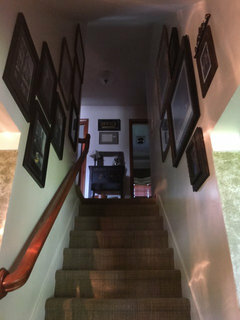 We love the look it adds to our stairway. 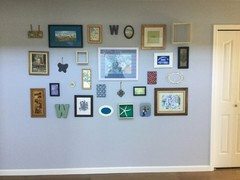 I adore gallery walls, it is also a great way to display stamps; I am a stamp collector. Also, cool postcards look cool!